A Tribute to the Best Thing about the Sochi Winter Olympic Games | hesaidwhatnow? The Winter Olympic Games are aptly named. This is because the events are exactly that: games, not sports. As such, I have virtually zero interest in them aside from watching the odd crash on the slopes or the funny reactions of losing figure skaters with poor sportsmanship gamesmanship. However, even I need to stop and give credit where credit is due. There is one team of athletes competing at these Games who deserve every ounce of our respect for their amazing accomplishments. A team who stand for the absolute peak of human perfection. Idols against which all of us are measured, and found wanting. 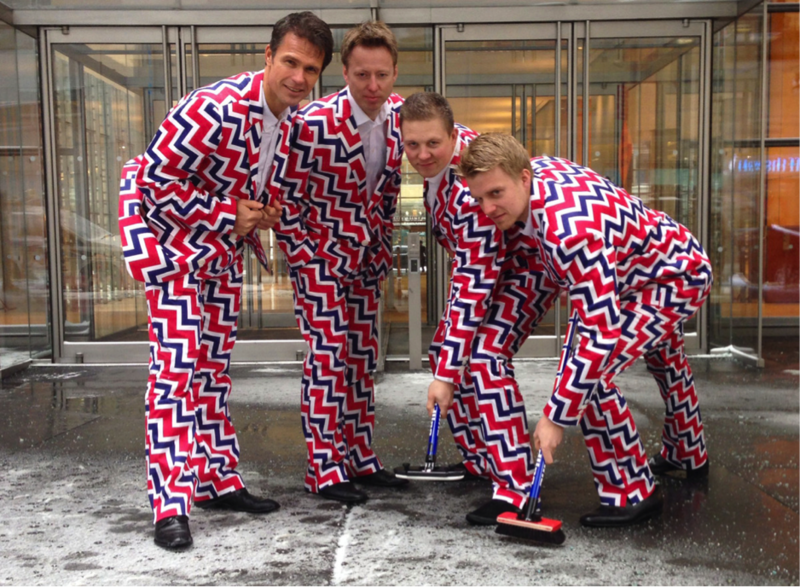 I’m talking, of course, about the Norwegian Curling Team. For those of you unfamiliar with curling, the sport game is something like lawn bowls on ice, only if lawn bowls included domestic chores. 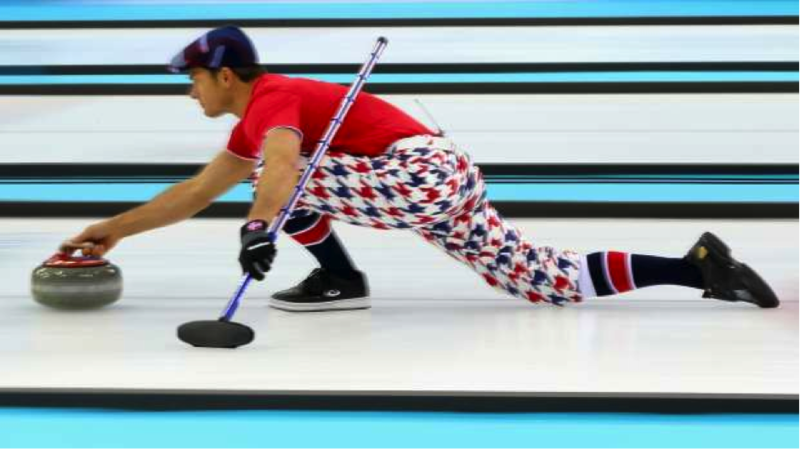 Norway is probably excellent at the sport game – I have no idea, and I have no idea how they’re doing at the Games; all I know is that they love rocking the most awesomely terrible outfits of all time. You may not be able to spot the team as they pretty much blend into the bleak grey background, but that is them in the matching suits boldly patterned with the colours of the Norwegian flag, bent askew in a thick zigzag. In stark contrast, they are wearing very sensible white shirts and black shoes; not sure what happened there. Also note that the teammate on the right, Havard Vad Petersson, looks particularly displeased at being interrupted whilst he was trying to remove snow and debris from the building’s entrance. I’m sure you’ll agree that the above sartorial display is so amazing that it must have happened at a serendipitous moment where the stars aligned and everything came together in costuming magic, never to be recreated. You may have noticed that wedged between their perfectly reasonable jackets and the same sensible black shoes as their promo shot, the team seem to be wearing pants not too dissimilar to what your grandfather might wear to bed. 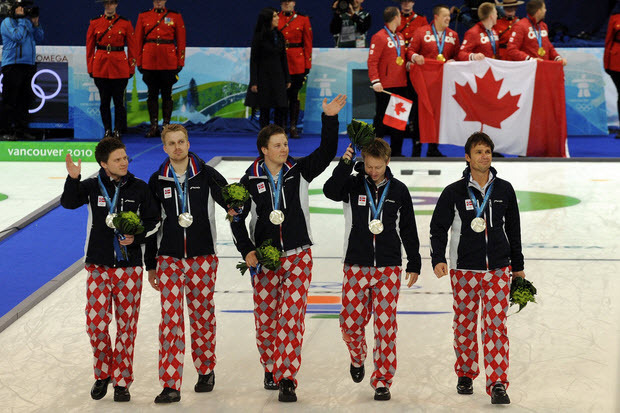 My theory is that there was a terrible laundry accident in Vancouver that ruined their tracksuits, leaving them with no alternative other than to wear their pyjamas onto the podium. They were able to cover the tops with their jackets, but alas, their pyjama pants remained exposed to the world. 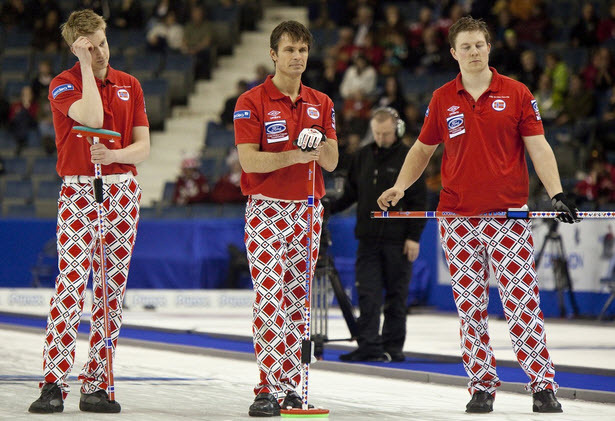 Instead of being embarrassed by the event, the Norwegians embraced it, and realised that the world of curling needed a team of brash, pyjama pants wearing sportsman gamesman to spice things up. And from there they flourished. 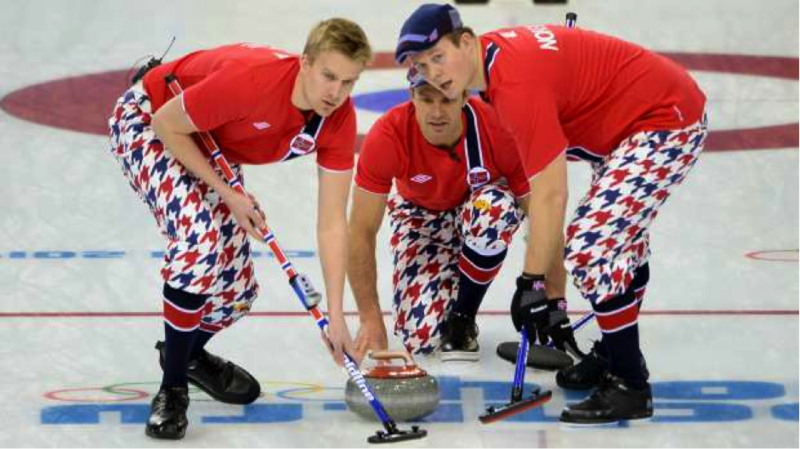 The Norwegians rocked the pyjama pants again, and with great aplomb. Knowing that they needed to top their efforts at Vancouver, the team offset the PJs with a whole new ensemble. Holding the adorably ghastly slacks in place are stark white belts, and completing the ensemble is what appears to be a matching set of mechanics’ shirts. All in all, you’ll agree, an absolutely smashing uniform. Some people just know what to do with pants, don’t they? 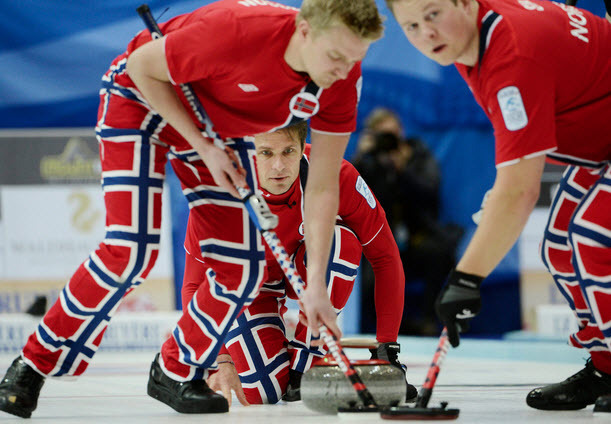 Proudly displaying their affection for their homeland, these pants exhibit a pattern of repeating Norwegian flags in the bold red, white and blue of the national standard. They stand, as always, on a foundation of the plain black shoes they know and love best, and one competitor wears a matching glove. Look closely at the gentlemen crouching in the background, Thomas Ulsrud. Could that be the collar of a skivvy peeking out from his shirt? I hope so. Given all of the above, the question on everyone’s lips was this: just what exactly would the Norwegians have in store when they actually took to the ice at Sochi? Would they be able to live up to the high standards they had set for themselves? Where to start? As always, it has to be the pants. The signature colours are there, this time aligned in a kaleidoscopic geometric pattern that dazzles and intoxicates. What exactly are the shapes? It’s unclear, although I would contend they are either ships from Space Invaders or a cartoon representation of Gene Simmons’ hair. The signature black shoes are present, although wedged between them and the crazy pants are a new inclusion: mid-length socks. Broken by a thick red line bordered by white stripes, the socks are a dark blue that clash with the blue of the pants, which is several shades lighter. But not to worry, as the darker colour slashes down the left side of the team’s polo shirts, recalling images of half a pair of braces. What elevates the ensemble above perhaps even their own gold standards are the additional accessories. John Christoffer Svae, on the right, is wearing a rather fetching pair of gloves, no doubt enhancing his sweeping capabilities. The real flourish that puts this outfit over the top, however, are the flat caps. All that is left to say is this: whether or not Norway come away with gold, they are clearly winners in all our hearts. Now I’m off to buy some new pants. ← Zombeavers: The New Sharknado?